With Justice League now in production over in London, we’re starting to hear more about what Warner Bros. and Zack Snyder have in store for us, including who exactly will be appearing in the film. 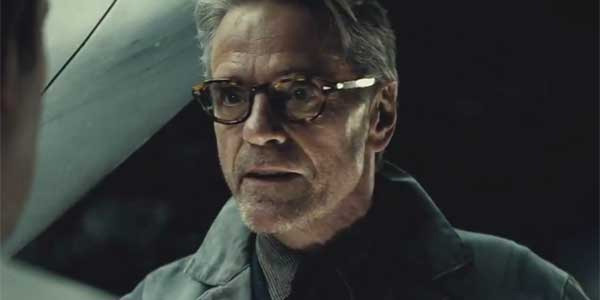 We already know that we’ll be seeing Ben Affleck, Gal Gadot, Ezra Miller, Ray Fisher, Jason Momoa and Henry Cavill (in at least some capacity), and now we have confirmation that Jeremy Irons will be back as well, reprising his role of Alfred Pennyworth. Speaking to Showbiz 411, the actor confirmed his return but wouldn’t say how big of a role he’ll play in the film. He factored into Batman V Superman: Dawn of Justice quite heavily, but given that there are so many more characters fighting for the spotlight this time around, who knows how much room the story will have for him. However it ends up playing out for Alfred, we’re definitely happy to see him back. He was a definite highlight of the otherwise mediocre Batman V Superman and seeing as The Caped Crusader will be very much at the centre of Justice League, it makes sense to have his trusty sidekick there to help him. With Irons now confirmed, the question turns to whether or not we’ll see Superman’s supporting squad back in action as well (Lois Lane, Perry White, etc.) Seeing as the Man of Steel probably won’t be factoring into Justice League very much (or at least, we assume), I wouldn’t be surprised if Snyder sidelines them until the second part of the film, where Superman will presumably have much more of a presence. Justice League will hit theatres on November 10th, 2017. Tell us, what are you expecting/hoping to see from the film?